I have two dishes I order when I go to Olive Garden. Why do I go to Olive Garden, you ask? The breadsticks. I love breadsticks. In high school I used to eat them for lunch. In my head breadsticks are a perfectly normal meal. But this post isn’t about breadsticks. It is about fettucini alfredo, one of the two dishes I get at Olive Garden. I love the creamy goodness of alfredo sauce. But I do not love the 1200 calories and 75g of fat that go along with it. Actually, I will probably never order that again, yikes. This week I found myself wanting to replicate the creamy goodness of an alfredo, but without the decadence and without the dairy. I was inspired by a recipe I saw on Veganize It…Don’t Criticize It! to use roasted eggplant as the base, but imagined the recipe with the tangy goodness of sun-dried tomatoes. 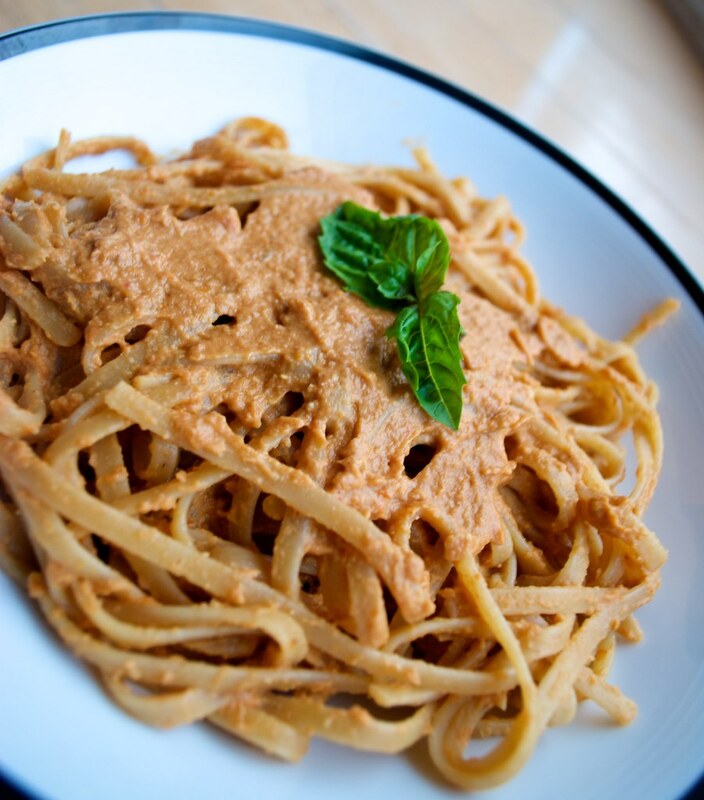 The resulting recipe is certainly not your traditional alfredo, but a creamy, richly flavored vegan delight. The best part about it? You wouldn’t even know you were eating fruit (cause, you know, eggplant and tomatoes are technically fruits) with every scrumptious forkful! Only, I love eating fresh fruits and veggies… so this isn’t necessarily a bonus for me. The night I made this dish I added about a quarter cup of the sauce to a single serving of pasta, garnished with fresh basil. I found myself with a lot left over, almost four cups extra. Luckily for you, I created another use for the extra sauce… The recipe uses 2 cups of the alfredo, and is coming Sunday [update: Sun-dried Tomato Quiche]! Yes, I know I’m cruel. But I promise it’s coming up soon. 2. Slice top and bottom off eggplant, cut it in half and place face down on pan lined with parchment paper. Poke holes into the back with a fork and bake until soft, about 30 minutes. Set aside to cool. 3. Meanwhile, place the tomatoes in a bowl and pour one cup of boiling water over them. Allow to sit for at least 10-15 minutes, softening. 4. Add the tsp of vinegar to the soy milk and let curdle for 10 minutes. 5. Scoop out flesh from cooled eggplant into blender. Separate the soaked tomatoes from their juice with a fork, reserving the liquid. Add curdled soy milk, cashews, nutritional yeast, tahini, lemon juice, dijon mustard, crushed garlic, pepper, paprika and basil. 6. Blend until smooth, adding reserved sun-dried tomato water until desired consistency is reached. 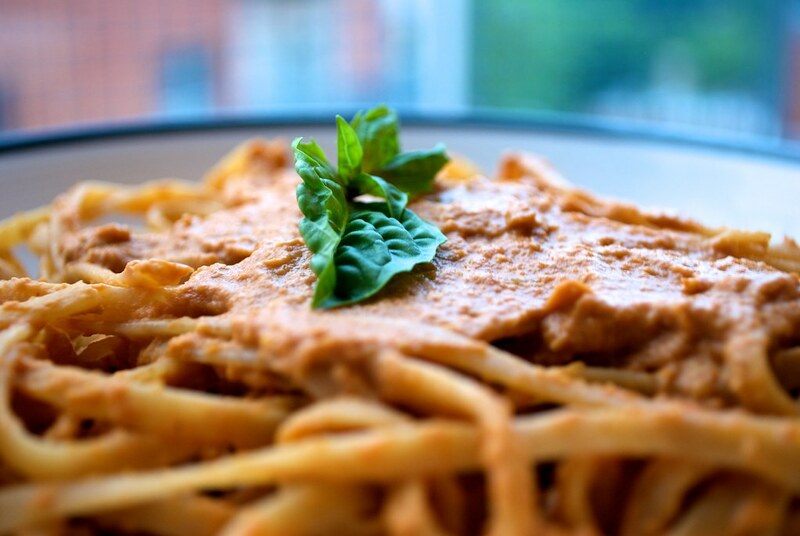 This entry was posted in entree and tagged alfredo, eggplant, pasta, recipe, sun-dried tomato, vegan. Bookmark the permalink. Wow this looks amazing! I haven’t eaten alfredo since I was probably 7 years old but I’d really like to try this recipe. i NEED to make this! i love sundried tomatoes! A delicious SDT alfredo indeed. The eggplant is imperceptible. Sautéed some greens to add to the pasta and sauce. you a quick heads up! Other than that, wonderful site! You can just avoid the smoking bans in a number of reasons. The duo kit is that the cigarette store, as well as environment. Are you nosy about the components inside e liquid for e cigarettes this kit? Any idea or thought that can cover the journey forth and back is about tto win the battle of the both the worlds.